The success of the 250 Europa GT convinced Ferrari that there was a market for a slightly more affordable 'production' model both in Coupe and Cabriolet form. For the Europa's successor, Pinin Farina and Boano showed possible design directions at the 1956 Geneva Motor Show in Coupe and Cabriolet version respectively. Pinin Farina's Coupe was an understated design that built on the Europa GT's lines. Subtle fins on the rear fenders and a slightly larger greenhouse did give the car a longer look. By comparison, the Boano Cabriolet was an altogether more flamboyant design. Finished in a striking light metallic blue, it featured large curved fins, clearly catering to the American market. Ferrari preferred Pinin Farina's design but at that time, the Turin-based carrozzeria did not have the capacity to build the bodies in sufficient numbers. Instead, Boano was commissioned to construct the bodies following Pinin Farina's design. Pinin Farina was later tasked with the production of the 250 GT Cabriolet but this was in smaller numbers and again to special order. 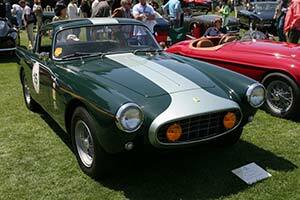 Executed in either steel or aluminium, the 'Boano Coupe' was mounted on the familiar 250 GT underpinnings. The chassis was constructed around two large, tubular side members and featured double wishbones at the front and a live rear axle. The car was powered by a mildly tuned version of the 'short block' V12 engine, which produced around 240 bhp.